Samuelsson: "It will be a tough year and a year of turnaround. But we have a new team, strategies and tactics in place." 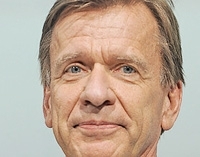 GENEVA -- Volvo's U.S. sales are off to a poor start in 2014, but CEO Hakan Samuelsson expects volume to pick up in March and April and to increase about 5 percent for the year. Sales fell 20 percent in the first two months to 7,783 in a market down 1 percent. But they will pick up as the new V60 sport wagon and a new generation of four-cylinder engines becomes available next month, Samuelsson said this month in an interview at the Geneva auto show. "It will be a tough year and a year of turnaround," he said about the United States. "But we have a new team, strategies and tactics in place." Volvo's U.S. sales could grow to 65,000 this year, up from 61,233 in 2013, he said. But he said sales will not increase substantially until the redesigned XC90 crossover is introduced in the United States in early 2015. The crossover will have Volvo's new Drive E family of four-cylinder engines, including a plug-in hybrid with 400 hp, he said. Before entering new segments, Volvo will replace all of its existing cars -- the S80 mid-sized sedan, S60 compact sedan, XC60 compact crossover and C70 wagon, he said. All will be on Volvo's new scalable architecture for mid- and large-sized vehicles. That process will take several years, according to Samuelsson. But even after that, he questions how many variants Volvo could make. "There is the appetite for this, but it is important that you manage complexity," Samuelsson said. "We will be very careful not to overutilize the technical means that the modularity offers."